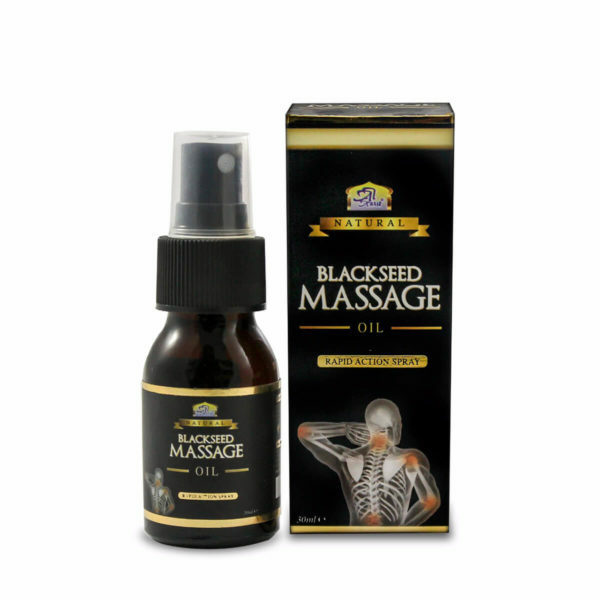 Black Seed Massage Oil contains natural extracts of herbs & essential oils that have the ability to penetrate deep into the affected areas to heal the symptoms. It penetrates the body tissue faster than any other oil because of its strong anti-inflammatory actions. It is a sensual way to relief exhausted and fatigued muscles. Black Seed Massage oil is very effective in the treatment of arthritis, back pains, frozen shoulders, lower body pain and muscular spasms. Helps to relieve various body aches. Penetrates, soothes and relaxes the affected area. Apply evenly on the affected area and massage it gently until fully absorbed. Repeat it as per need. Black Seed Oil, Turpentine oil, Eucalyptus Oil, Iso Myristate, Methyl Salieylate, Menthol. -Discontinue use on sensitive area if excessive irritation occurs. -Protect from heat, sunlight & naked flame.